Geodesy is the study of the measurement of the shape of the Earth, including local gravity and how the shape of the Earth changes. InSAR stands for 'Interferometric Synthetic Aperture Radar'. This satellite technology is used to measure ground motion from space. As magma moves upward through the crust, the surface is also pushed upward. As little as one centimeter of uplift can be detected by InSAR satellites! What does InSAR look like? InSAR maps are similar to elevation contour maps used by hikers. Instead of elevation, each color contour corresponds to a certain amount of uplift. 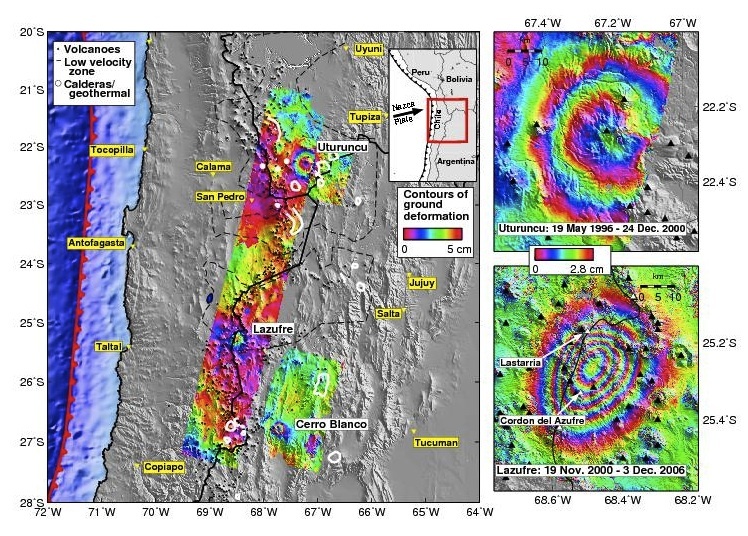 These maps often show a circular pattern centered on volcanos. 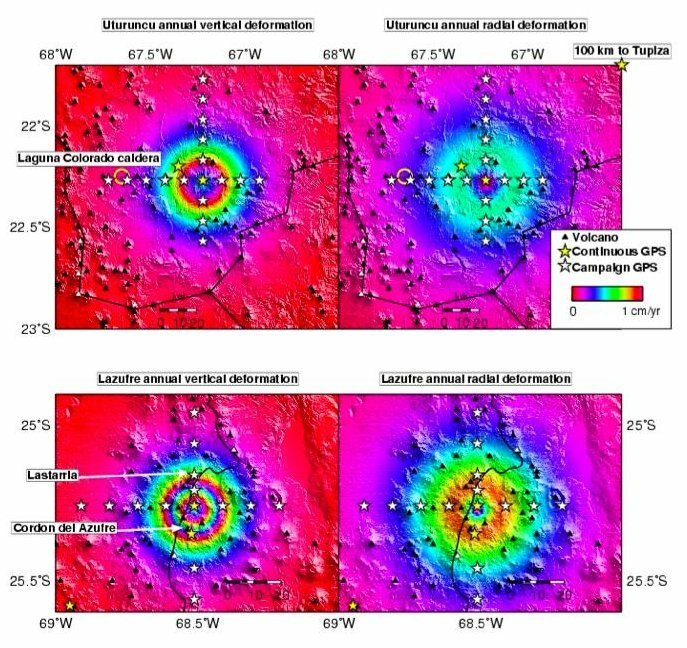 The upper right map shows uplift at Uturuncu volcano over the last four and a half years (uplift rate about 1.5 cm/year), while the lower right shows uplift over 6 years at Lazufre (about 3 cm/year). Joint effort between Cornell & Bristol, sharing data with other GPS arrays in Chile, Bolivia and Argentina. Dr. Jo Gottsmann is a geophysicist and volcanologist in the Department of Earth Sciences at the University of Bristol. He specializes in measurement of surface displacements by the Global Navigation Satellite System (includeing GPS) and changes in the gravity field at volcanoes. Dr. Matt Pritchard is an Assistant Professor of Earth and Atmospheric Science at Cornell University. Matt is a geophysicist who uses InSAR satellites to study South American volcanos. Mayel Sunagua Coro is a geologist who works for the Bolvian Geological Survey, Sergeotecmin. He specializes in field studies of active volcanos throughout Bolivia.